In the comments, Bob asked about the picture of the cross I posted yesterday. The doves are attached to strong wires. During the memorial service, the family members of pastors who died last year came to the altar, each with one of these doves. The doves were then attached to the cross. The cross that evening also had candles on it. It was beautiful. The cross with the doves (no candles) was placed in the back of the altar area the next day. It was terrific looking -- as if the doves were flying around the cross. The theme of Annual Conference involved the idea of power from the Holy Spirit. Doves were everywhere, including flying off the balcony railing. The top middle image in the collage is one of those doves. 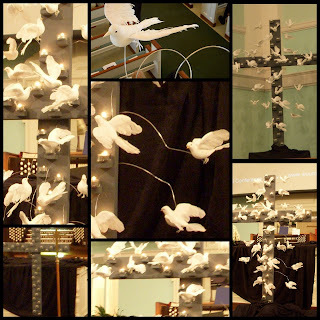 Images: (Starting in top left hand corner and moving clockwise, and then finally to the center) Upright of lighted cross, dove flying off the balcony railing, unlighted cross, lighted cross, horizontal railing of the cross, cross prior to memorial service, and in the center, detail of doves, showing wire. Thank you, What a beautiful idea after all aren't we all attached to the cross.